Most vegetables and flowering plants need sunny locations to do their best. But shady areas in your garden need not be bare, or without excitement, if you grow a wide selection of shade loving herbs. Many herbs do equally well in the sun and in the shade, but some, especially the tender ones, are partial to shade, at least during the hotter part of the day. The following herbs can be successfully grown in shady areas of your garden. Parsley is a Mediterranean herb that has become popular as a culinary herb in almost every part of the world. It is a biennial plant that grows a rosette of leaves in the first year and sends up a flower stalk the following year. However, it is often grown as an annual, with the leaves or the entire plant harvested for the table in the first year itself. The root can be used as a vegetable in stews and soups. The leaves act as a breath freshener when chewed. A poultice of the leaves can be applied to insect bites and bruises for pain relief. Parsley comes in two varieties, the flat-leaved Italian parsley (Petroselinum neapolitanum) and its curly-leaved cousin (Petroselinum crispum). The more flavorful Italian parsley is commonly used in cooking while the crispy, beautifully ruffled leaves of the other are used for garnishing dishes. Parsley needs moist soil rich in organic matter to do its best. Although it can grow in full sun, light shade is better for the lush growth of the leaves. The herb is grown from seeds, but it has a long germination period, thanks to the furanocoumarins present in the seed. Parsley thrives in USDA zones 5-9, preferring a temperature range of 70 to 85. However, it is very cold hardy, remaining green even in freezing temperatures. Commonly called Chinese parsley, this herb with intense flavor is loved by some, but hated by others, who reportedly feel a soapy taste. Cilantro is nothing but the annual plant that gives the spice coriander once it flowers and sets seeds. However, there is a world of difference between the fresh, slightly citrusy flavor of the leaves and the spicy-sweet seeds. Coriander belongs to the same Apiaceae family as the Italian parsley, and has similar growth habits and cultural requirements. It is easily grown from seeds, and thrives in rich, moist soil containing plenty of humus. The older leaves can be harvested regularly as the plant develops more tender leaves from center of the rosette, or the entire plant can be pulled up and used finely chopped. Cilantro can be grown in USDA zones 4-10. Although it can grow in full sun where ample soil moisture is present, there is the risk of the plant bolting––or developing flower stalk that marks the end of its vegetative growth. It also results in bitter leaves. Partial shade helps maintain the taste and flavor of the herb and ensures a steady crop of larger leaves. Chives can be successfully grown in USDA zones 3-10. Start it from seeds or by divisions of the clumps. Once established, they faithfully come back year after year, enlarging their clumps in the process. Rich, well-drained soil is ideal, although they can survive in less than ideal conditions too. They prefer some moisture in the soil, but waterlogging should be avoided. Chives can thrive in full sun, but light shade, especially during the afternoon, is preferred. Shade-grown chives may not develop as many flowerheads, but that is a good thing since self-seeding is a big problem with this herb. Snip off the lower leaves and any flowers that come up. Common mint with its bright green, quilted leaves and fresh aroma and flavor is a delight to have in the garden. It should be ideally planted close to the house and along walkways where its fresh fragrance can be enjoyed every time someone brushes against it. However, many gardeners prefer to grow this perennial herb in containers since its spreading habit can be a nuisance. Mint is easily propagated from seeds and cuttings, and thrives well in well-drained, moist soil. You can find mints that grow in any USDA zone. For instance, Peppermint ( Mentha x piperita) is ideal for USDA zones 3 to 8, while Spearmint (M. spicata) is perfect for zone 5 to 9 and above. Mint likes light shade, especially when grown in warmer areas. It tends to grow leggy, but frequent pruning helps the herb remain bushy. It will give you plenty of leaves to make digestive teas and pretty garnishes for years to come. There are several types of thyme, but the commonly cultivated variety is the English thyme. It has a highly branching and spreading hab, and bears tiny leaves and pink or purple flowers. The spicy flavor of thyme is welcome in many meat dishes. It is especially good with vegetables like cabbage that have a strong taste and flavor. Sprigs of fresh thyme form part of bouquet garni, but you can use just the leaves and discard the woody stems. Thyme grows well almost anywhere, and can be cultivated as a perennial up to USDA zone 9. It can survive drought and light freezes, but requires some protection in winter. It does well in sunny locations, but prefers some shade, especially in warmer areas. It forms a neat groundcover around the bases of trees in the garden, enjoying the shade. If you start with a sprig planted in spring, it will soon spread to form an aromatic carpet, providing you with more herb than you can use up. But the leaves can be frozen or dried for winter use. Frequent pruning keeps the plants healthy and green. Among the different types of Tarragon, the highly aromatic French Tarragon is commonly used as an herb and deserves a place in the garden. It is a slender plant with long, narrow leaves that have an anise-like flavor. Although tarragons are flowering plants belonging to the daisy family, French Tarragon rarely produces flowers. They are sterile anyway, so the herb has to be grown from either stem cuttings or root divisions. Tarragon loves rich, well-draining soil, but poor soil intensifies its flavor. It should be watered not more than once or twice a week; the rhizomatous roots can rot in wet and waterlogged conditions. The herb thrives in warmth, but cannot stand very high temperatures. It does well in places that get full morning sun, but requires afternoon shade, especially in warm areas. Harvest the young stems for fresh herb or freeze or dry them. Angelica is a tall herb that has a celery-like flavor and can substitute celery in dishes. Candied stems of Angelica used to be a popular cake decoration. Angelica has medicinal value too. The candied stems are often given to children to relieve digestive problems and cough. Angelica can be grown in USDA zones 4-9. This sweet flavored biennial herb prefers woodland conditions, requiring ample shade and soil moisture to do well. You need fresh seeds to grow Angelica because they lose their viability pretty quickly. The plants produce only leaves in the first year. These large leaves are highly divided into leaflets which give them a lacy look. The tall flower stalks with fewer leaves come up in the second year, carrying large umbrellas of tiny, nectar-filled flowers. You can plant Angelica in the shade of shrubs and trees where it can enjoy the dappled shade and the slightly acidic soil. It needs plenty of space to grow and spread out, so it is fine to grow it in a remote part of the garden and gather the leaves and stem as and when required. It is another shade-loving herb preferring cultural conditions similar to Angelica. However, it is a ground hugging perennial plant that can be enjoyed closer home. They are usually grown for the air-freshening smell of the pretty leaves and the pure white, starry flowers that can brighten up the darkest corners of the garden. Sweet Woodruff can be grown from seeds or divisions in USDA zones 4-8 and overwintered with some amount of protection. Give it a shady location with rich, well-draining soil and it will soon send out runners to cover the entire area with sweet-smelling ground cover. Use Sweet woodruff in small quantities to flavor soups, syrups and wine, or for making a relaxing tea. A poultice of the leaves can be applied on sprains, hemorrhoids, and swollen joints to get pain relief. This colorful herb with anise-like flavor deserves to be grown more often. Commonly called Beefsteak plant or Red Chinese basil, this purple-colored plant belonging to the mint family can be used as a flavoring and coloring agent in pickles and in rice and vegetable dishes. Red Perilla can be grown from seeds and planted in moist areas with rich soil and some amount of shade. It does well as an annual in USDA zones 3-11, but areas with high humidity are preferred. Pinch off the growing tips to promote branching and to prevent the plant from flowering and setting seed early. This woodland orchid is a medicinal herb native to the Eastern United States. The entire plant consists of an underground rhizome and a ground hugging rosette of beautifully veined leaves from which arises an occasional spike of small, white flowers . A tea made from the leaves is used as a toothache remedy and the slightly wilted leaves can be applied to skin sores and burns for pain relief and faster healing. Downy Rattlesnake Plantain can be grown in USDA zones 4-10 as long as its woodland habitat can be replicated. Give it a shady location, preferably under an evergreen tree, and provide light, well draining soil, to which some peat moss or leaf-mold has been added. This herb gives the ginger root used as a spice in cooking and as a medicinal herb to treat nausea and digestive problems. The ginger root is actually a branching rhizomatous underground stem which send out top growth every now and then. Ginger is a woodland plant of the tropics, and it can be grown successfully as a perennial in USDA zones 9-12. Elsewhere, treat it as an annual, providing a warm, sheltered location. It is propagated by division of the rhizomes. When planted in early spring, with at least one or two growing buds or ‘eyes’ to every section, they sprout new leaves in a few week’s time. Mulch it well to keep in moisture and provide warmth. The plants complete their growth by the end of fall, the leaves dying out naturally. The rhizomes can be dug up and stored in a cool place to be used as fresh herb, or dried to make ginger root powder. This herbaceous plant with beautiful, heart-shaped leaves is commonly used as a groundcover in shady areas. The rhizomes spreading underground beneath the thick leaf cover can be used in cooking to impart a spicy flavor to dishes. Native American Indians used wild ginger to treat cold and fevers. Grow wild ginger anywhere in USDA zones 2-8, but give it moist, slightly acidic soil, preferably in the shade of tall trees. You can plant small sections of the rhizome, each with an eye or two, in late fall or early spring. They will sprout soon and send out stolons to spread and cover the area with their attractive foliage. This European native has become naturalized in many parts of the United States and has come to be known as Queen of the Prairie. The large, feathery clusters of flowers that appear from June to August are quite charming, but the herb is mainly grown for its sweet-smelling leaves and shoots. The leaves and stem can be used to flavor jams and jellies, wines and vinegars. The plant has medicinal properties too, thanks to its high salicylic acid content. In fact, this plant extract was the original basis for the preparation of acetyl salicylic acid which came to be known as aspirin. A tea of the leaves or flowers can be used to relieve headaches, but shouldn’t be given to children, asthmatics and those who are allergic to aspirin. Grow Meadowsweet in moist and shady locations in USDA zones 2-8. It prefers rich soil with good amounts of compost added to it. Anise is a European herb that has become a favorite all over the world. It is a delightful plant with lacy, aromatic leaves and large umbels of white flowers, ideal for growing in the shade garden. The leaves can be used as a flavoring herb and the fennel-like seeds as a spice in many sweet and savory dishes. You can grow it in USDA zones 4-9, but the seeds have to be sown in situ because the seedlings do not like to be transplanted once they start developing the taproot. 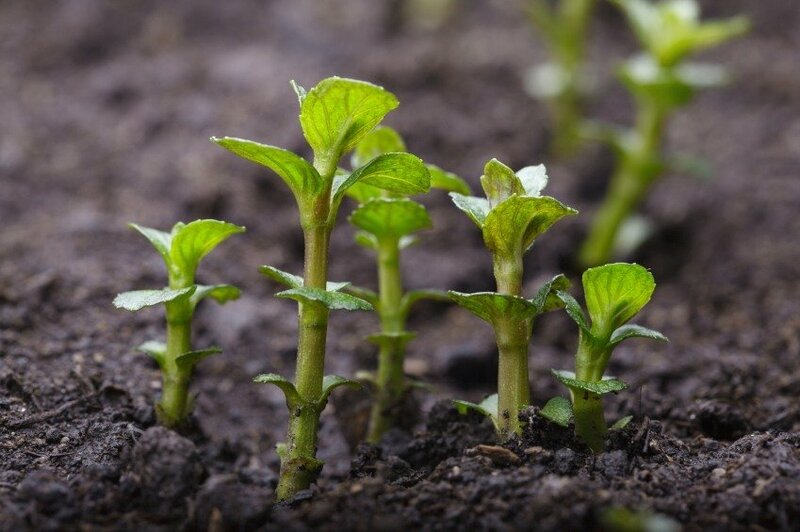 Start them as early as possible in well-drained soil in a shady spot because they need at least 4 months of warmth to complete flowering and produce anise seeds. This aromatic herb with a lemony scent has both medicinal and culinary uses. The leaves can be used to flavor fish and chicken, but since it loses most of the flavor in cooking, you should add them towards the end of the cooking process. Leaves can be used as a garnish for cold drinks and salads. Medicinal uses include a digestive tea made by steeping leaves in warm water. It can control bloating and vomiting. The calming tea relieves a headache and restlessness too. Grow lemon balm in rich, moist soil. It loves sun and warmth, but it can thrive in partial shade as well. It can be grown as a perennial in USDA zone 9-10, but may not survive cold winters elsewhere unless overwintered indoors or under heavy mulch. Frequent pruning keeps the plant bushy and prevents early flowering. So, if you have shady places and in need of some green and color to fill the space, consider some of the above herbs. Not only are they fun to grow, look great, but will also reward you with great seasonings for your meals and therapeutic needs.